We give the Nicotek Metro THREE STARS. It is NOT RECOMMENDED. We had unusually great expectations for the Nicotek Platinum Starter Kit. Our hopes for this e-cigarette brand were reinforced when the kit arrived quickly at our door. The vertical box got our attention immediately. We were pleasantly surprised by the way it managed to contain so many items in such a compact space. Inside were two cigarette style batteries, 10 cartridge/atomizers, one USB charger, one wall adapter, one DC adapter for a car, the user’s manual and its carrying case. After unpacking all of the Nicotek Metro components and accessories, we put it to the test. Nicotek cartridge atomizers come with double end caps. They are also shrink-wrapped. This helps to preserve their fresh taste. 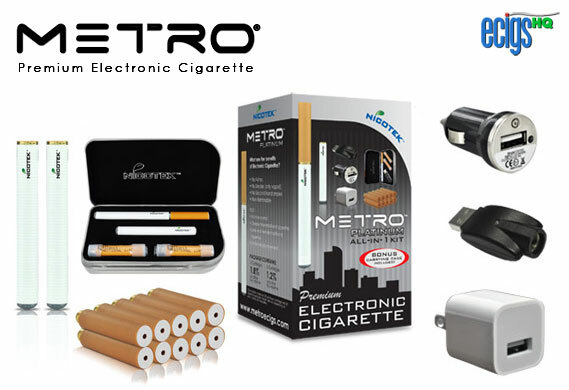 Exterior labels on the wrapping and on the cartridges indicate the flavor and Nicotine strength of each e-cigarette. This usually impresses us as a sign of the product’s quality. We quickly attached one of the batteries to a Traditional flavor cartridge with 18mg of Nicotine. We drew on the e-cigarette and inhaled slowly, hoping for a pleasant taste, a voluminous cloud of vapor and the satisfaction peculiar to smoking. Unfortunately, our hopes were dashed by the disappointing results. The taste was recognizable but it was nothing that we wanted to recognize. The vapor cloud was unimpressive and unsatisfying. A second drag on this new e-cigarette produced the same disappointing results. With the third draw on the device our negative judgment of the flavor was complete. However, we like to give products every possible chance to impress us. We left the battery to charge and hoped that a test the next day would alter our unfavorable view of the Nicotek Metro. While a properly charged battery could not improve the unpleasant taste, it might expand the vapor volume and provide some satisfaction from use. Unfortunately, the Nicotek Metro was not any more impressive the next day. After unwrapping a fresh cartridge atomizer, we attached it to a fully charged battery before taking a long, slow drag. The taste was as bad as ever and the vapor volume was unimproved. There was no comparison between this e-cigarette and NJOY, which remains among the best-tasting that we have reviewed. There was no point in punishing ourselves further with this product. We repacked the box and put it in the bin where we had consigned so many other rejects in our search for the Top 5 producers of e-cigarettes. Unsatisfying vapor volume and unpleasant taste are two qualities that can really drag down an e-cigarette’s rating. Even though the Nicotek Platinum Starter Kit comes with ten cartridge atomizers, the pre-discount price tag of $49.99 proves to be a poor value for this disappointingly bad product. In our estimation, the cost of maintaining a single-pack-per-day habit with the Nicotek Metro was an annual $1,083.33. This includes the price of the less expensive Nicotek Metro Economy Kit in place of the Platinum kit that we selected. This converts into a daily cost of $2.98 per day. Without regard to quality of experience, this price does create savings when you compare it to smoking regular tobacco cigarettes, which cost about $6 a pack. That comes out to $2,190 each year. In the course of that year, the Nicotek Metro would save you a little more than $1,100. In summary, we determined that the Nicotek Metro was a poor value. The savings do not make up for the inadequate vapor volume and the upsetting flavor. Vapor volume is unsatisfyingly low. Owing to the poor review, Nicotek Metro will not provide eCigs HQ with a coupon code.